Bouguereau also celebrated humanity's culture and literature in his paintings as seen in his mythological scenes of nymphs, cupids, and angels, and his scenes from literature, legend and the Bible - L'art et la Litterature [Art and Literature], 1867. 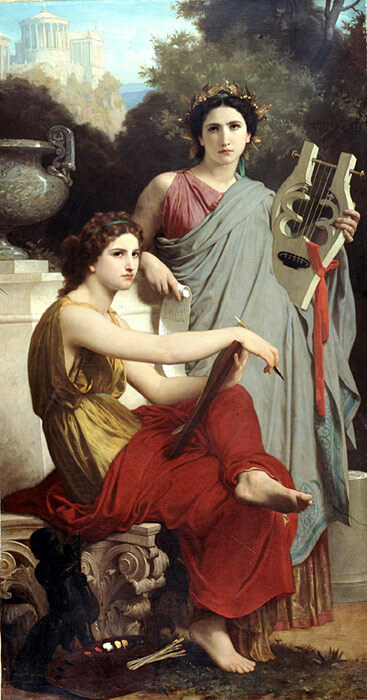 These wholly original compositions are handled by Bouguereau with an emotional force second to none. SPECIAL NOTE : The painter will make the reproduction as close to the original oil painting as possible. If you want your painting to alter from this likeness, please email us and " L'art et la Litterature [Art and Literature], 1867 " will be reproduced according to your special requirements.